I've decided to condense my writings into one convenient place on Http://FromALovingPlace.com. 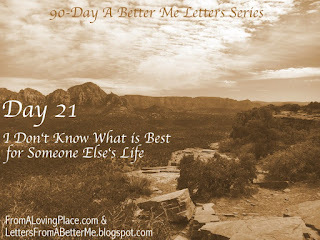 There will be a Letters from A Better Me category, so if you love the letters format you can go directly to it and find what you are looking for. I will never stop writing letters so you won't be missing out by choosing to follow me on From A Loving Place. That website is also linked to my Facebook and Twitter for easy and convenient ways to stay connected. It will take some time to transition, so you will be able to still read old posts here. There just won't be anything new. I’ve recently been made aware of how I’m attracting the energy of hate into my life. I really didn’t think that my negative self-reflection could have that big an impact on the reality I was creating for myself. I lived wondering why others seemed to have it so much better than I did, and judging the ones who had it worse. The energy I was putting out was so judgmental towards myself and others. I couldn’t scan social media or watch the news without attacking someone in my head. I didn’t realize that even by doing that I was creating a negative force around me. I kept wondering why the Law of Attraction practices didn’t work for me. I kept sabotaging myself by my thoughts, beliefs, actions, and reactions. I turned feelings into obstacles. I’m accountable for attracting the hate into my life. I didn’t know better and now I do. I’m not going to expect to miraculously change overnight. I know that it took me many years to develop these patterns. I’m open an willing to look at my behaviors openly to see how I can re-frame my thoughts to perpetuate the expanding love inside me. I will work on myself to make sure I’m being the kind of person that I want to see more of in the world. I will no longer let myself off the hook or come up with excuses. I will be and do better. That includes being gentle with myself even if I make a mistake. I want to put the energy out there that will attract the energy of love to my life. I can only do that if that what is what I’m emanating. Universe, please provide me with the teachers who will help me follow this path. Check out today's installment, "Attracting the Energy of Hate" on From A Loving Place. I will be transitioning this series and blog over to http://FromALovingPlace.com. In the days to come the 90-Day A Better Me Letters Series and the 35-Day A Better Me Boot Camp will be added to From A Loving Place. If you are following this page, but not From A Loving Place, I suggest you do this at this time in order for a smooth transition. Thank you for reading and following along on this transformational journey. Please read Day 24 on http://FromALovingPlace.combefore reading this letter. I’m choosing to let go of the anger because it has no place in my body. I’m choosing to focus my energy on the love I see in the world. I’m looking up stories of inspiration, hope, and positive change. This inspires me! My tears well up with joy when I see people being good to one another. I love seeing the stories of the strangers who drop everything and step up for others. I want to keep this joy in love in my heart. Instead of focusing on all the wrongs in the world including all the corruption and violence, my attention is going to go towards officers who are doing the right things. Politicians who I see as a genuinely good people who care about the countries they serve. I’m not going to limit myself to particular parties, I will focus on the people who help us come up with solutions to think of the whole, not one side vs. the other. I’m not going to manifest more separation by seeing my ideas and myself as separate. I will focus on the people who spread messages of love, it doesn’t matter if I believe every word they say, as long as I genuinely feel what they are spreading is love, I will support that. Doing these things makes me feel good inside. I feel lightness and so much gratitude for all the people who inspire loving action. I’m becoming more conscious of how I’m talking to myself and how when I belittle myself I’m feeding into the hate cycle. I’m doing the work to fuel my self-love so I project that instead of self-hate. I’m responsible for my feelings, but I’m not going to blame myself for having them. I just need to work through them step by step so I don’t take them out on someone else and manifest more hate. As for my actions and reactions, I will consciously choose actions that support living life from a loving place. I will do my best to remain present, so that I consider the people around me as well as myself. I will smile and laugh more to focus on spreading joy. I will do my best in conflict to stay present to what I stand FOR instead of Focusing on what I am AGAINST. I’m grateful for all my feelings that come up in me. I can learn from every feeling and thought that I experience. I’m committed to my journey of becoming the best version of myself. 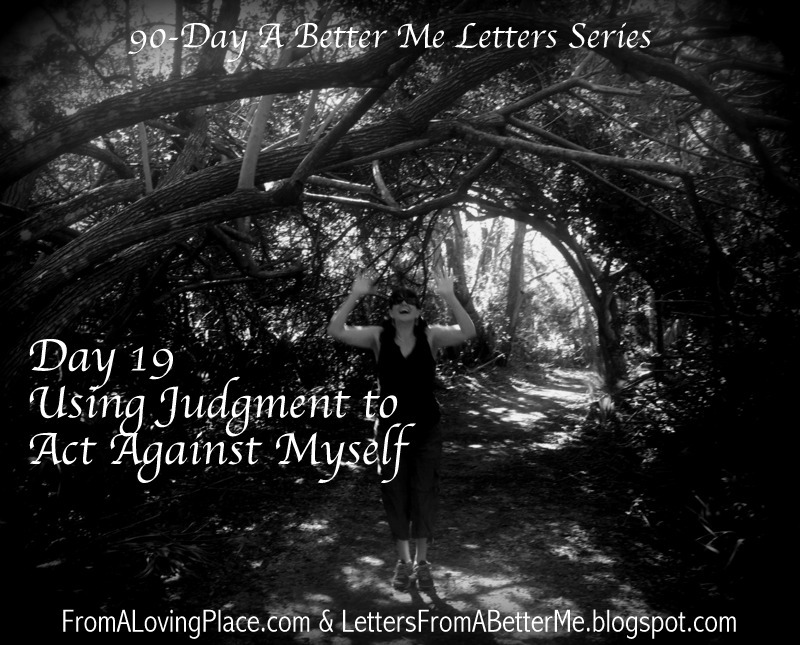 90-Day A Better Me Letters Series:Day 23 - Where Am I Holding Energy of AGAINST? Day 23: Where Am I Holding Energy of AGAINST? I’m committed to becoming aware of where I’m holding onto energy of AGAINST. I’m willing to look at areas in my life where I put out an energy I don’t want to see come back to me. I’m ready to see where I’m sabotaging myself by acting against what I want to myself. I realized by putting my energy in what I was AGAINST it kept me from focusing on what it was that I was really looking change and finding the how and why of what I’m working towards. I feel a hot energy boiling inside me when I’m in that energy and it doesn’t feel good. I feel like a victim in that energy. I feel attacked and the want to fight and go to war AGAINST my enemy, even if that enemy is myself. I am FOR living a healthy lifestyle. This means I need to give myself love and respect to take care of myself. This means I need to do things that are beneficial to the outcome I am looking for. I need to become aware of all of the areas I’m not focused on living a healthy lifestyle and the excusing I’m making for not doing it. If it is really what I want, and I think I deserve it, I WILL commit to what it takes to live according to that lifestyle. I am responsible for making sure my energy is aligned with what I want. For now, I will focus on my awareness of how my acts against myself come from a negative energy that engages my rage, vengeance, hate, and violence. I will be conscious of the energy I’m putting out in the Universe. If you like what you’re reading, don’t forget to sign up to follow here or on From A Loving Place. I’m ready to start becoming aware of my hate. I realize now that I’ve been letting hate unconsciously guide me in a direction that I don’t want to be going. I’ve been acting in a way that is contributing to the cycle of violence that I’ve feared for so long. I know that my hate has been creating only more hate and I’ve been watching it build up inside of me. I can see it on the roads when I’m driving in traffic. I can see it in my judgments of people who dismiss other human beings in front of them in the stores I shop in. I can see it when I think of words being used that make my skin crawl. I even see it when I think of textures of food. That’s just everyday ways I let hate seep into my life. I haven’t even begun to cover my feelings about narcissists, sociopaths, child molesters, rapists, oppressors, chauvinistic leaders, murderers, and hate groups. I feel my body shift and stir as the thoughts of violent and hateful individuals work their way into my thoughts. What I realize now is that I’m responsible for the energy that I’m letting into my internal world. I can’t make these individuals different than they are. My negativity isn’t going to change something in them, all it will do is change something in me and it won’t be for the better. I’m giving them the power over my thoughts and energy and that is the last thing that I want to do. I’m committed to focus my energy on what I want to be feeling and spreading. I have to really become aware of when I’m not paying attention to the hate-filled energy building up inside of me. I will work to re-frame my thoughts to be more constructive. I will search out different perspectives that will help me stay in a loving energy. I sometimes forget that I’m not in control or responsible for the outcome of other people’s lives. I don’t know what is best for someone else’s life. I have to remember that it is not my business what someone does with any information I contribute to the situation. It’s my business what energy I’m choosing to put out there for them to receive. All I know is that I don’t want to contribute to someone else’s shame cycle. I don’t want to feed energy that will encourage more negative cycles. What I want to do is make sure I’m spreading love, hope, and encouragement. I’m committed to becoming aware of the energy I’m spreading when I feel judgment of other people’s lives coming on. I am going to focus my energy on spreading love into the situation instead of spreading fear. The truth is someone else’s challenges can lead them down an amazing path that I’m and they are incapable of seeing right now. Either way, if I continue to work on myself, I will project and perpetuate more of the energy I want to see in the world instead of focusing on what I don’t want to see. I’m grateful for my lessons teaching me to be responsible for what I’m putting out there. I’m grateful for being aware enough to know that I don’t know what is best for someone else’s life. I’m very grateful that I have the power to change my own life and that is what I’m responsible for. I now see how I’ve been using judgment both towards myself and towards others to tear myself down. I see where the energy of judging has kept me trapped in a place I’ve been struggling to get out of. I see that my judgments don’t change anything. They just make my problems bigger. I can’t fight other people’s judgments about me. That is their own issue. I can simply be and do the best I can to lead the life I want to live. I don’t have to take any of their judgments personally, because how they see me is a reflection on them. If they are a person who is meant to be in my life, they will appreciate my value. If they don’t, they won’t. That’s okay! They are doing me a favor by showing me who they are. That way I can decide what place they will have in our out of my life without letting their views affect my inner world. I’m committed to putting out the energy that will lead me to being the best version of myself. This means I need to be aware of how I’m using my judgments at all times. If I’m not, I can easily slip back into unhealthy thought cycles. I know the power is in my hands to change. I’m grateful I’ve seen my choice in this situation, so that I have space to come up with solutions that will work in and for my life. I’m so grateful for the understanding that nobody has the power of my thoughts, feelings, actions, and reactions except for me. This gives me a sense of freedom that no one will be able to take away from me. Are you keeping up with the daily letters and messages? If not, simply explore the blog and go back through. You can start at Day 1 or pick and choose topics based on what you want to focus on. Enjoy the journey any way you want to! Don’t you love having choices?? Go to http://FromALovingPlace.comfor today’s companion piece. I had no clue how my judgments were affecting my reality. I never understood why I my good deeds didn’t seem to feel as good as I thought they would. My underlying judgments of people, places, things, and even ideas were putting out energy for what I don’t want. I’m actually contributing towards the causes I’m against instead of what I’m trying to represent. Now that I know better, I can do better. I’m going to clean up my foundations of judgment so that I’m putting my energy where it belongs—On what I DO WANT! I also am aware of how I’m letting other people’s judgments affect my foundation. They only can do this if I give them permission to. I don’t have to accept any judgments and/or beliefs that I don’t want to or that don’t feel right for me. I can be aware if their judgments are coming from a place of fear or a place of love. I can CHOOSE whether or not to accept what they are putting out there. I don’t have to let anything someone else says or does affect the energy inside of me. I will commit to become aware of my judgmental energy and work to reframe it from a place of love instead of a place from fear. I’m committed to coming up with solutions from a loving place so that I won’t be drained by the energy I’m putting out there. I will be ignited by the loving energy inside me. If I fall back into my judgments and/or accept unwanted judgments from others, I will learn from them and commit to looking inside to see why I keep putting my focus there. I will reframe what doesn’t sit right inside of me to help me support the life I want to be living. Have you gone to From A Loving Place yet to get today’s message? I’ve been avoiding the truth by focusing on the blame. I’ve used blame as the excuse not to live better. I’ve used blame as the excuse for not doing better for myself and/or others. I’m responsible for not taking the actions I needed to take in order to improve my life. I’m ready to see the truth behind the blame now. I’m ready to become aware of how I REALLY feel about myself. I’m ready to challenge my thinking anytime I see it moving in blame’s direction. I’m ready to take full responsibility for my thoughts, feelings, actions, and reactions. NOBODY and NOTHING can make me feel like I’m unworthy, less than, or a victim. I am the only one who can make me feel that way. I’m choosing to live better today than I did yesterday, not because my circumstances have changed, but because my mind has. I know I have the power to change my life now! I’m done giving my power away to people, places, and things. The energy I put out is what I will get back 100% of the time. I’m accountable for what I put out there. I will not let blame conceal the truth today. It is what I do today that matters. I know this process to transform my thinking will take time. My commitment is not to blame myself on days I fail to stay out of the negative energy, but to learn from those day. Just the awareness of this concept makes me a better me. I commit to the work that will keep me on this path. Make sure to go over to http://FromALovingPlace.com to read “Blame Conceals the Truth”. This is one of the most important concepts to understand in order to get out of our own way. Are you following along with the series yet? Don’t miss a beat! Follow me by entering your e-mail below and/or following me on From A Loving Place. It’s time to take some responsibility in how I’m perpetuating the blame cycle. When I blame others for how I view my life, I’m perpetuating the blame cycle. When I’m blaming others for their influence on the world, I’m perpetuating the blame cycle. When I sit and point fingers left and right and don’t take into consideration what I’m doing, I’m perpetuating the blame cycle. If I’m engaging in thoughts that tear people down over their mistakes, I’m perpetuating the blame cycle. If I’m putting my intentions and perceptions onto other people’s actions because I feel I’m right and their wrong, I’m perpetuating the blame cycle. If I beat myself up for being different than I want to be in my thoughts, feelings, actions, looks, and beliefs, I’m perpetuating the blame cycle. I can take personal responsibility for my thoughts, feelings, actions, and reactions without giving energy to the negative power of blame. Perpetuating the blame cycle is a choice I make consciously and sometime unconsciously. I will do better to make more conscious efforts to be aware of how I’m perpetuating blame in my thinking. I’m committed to being the best version of me I can be. Don’t forget to head over to http://FromALovingPlace.comto read “Perpetuating the Blame Cycle”if you haven’t already. I’m actively watching how media affects my perspective. WOW!!!! I never realized how much of my perspective comes from what they are telling me. I not only see what it does to my thoughts, but I can actually feel my body reacting to what I’m seeing and reading. My energy shifts if I read a story where the media is asking me to blame. Sometimes I feel the anger well up inside of me to the point where I feel this inner rage bubbling up under the surface. I can get to the point where I hear a person’s name and instantly my thoughts go into blaming the person for so much of the hate that is going on. I didn’t even realize that I did that before. I was so unconscious of it. On days I am heavily affected, I walk around with a chip on my shoulder. I feel like I’m waiting for someone to rub me wrong. I can’t even drive down the road without my inner rage boiling over. I hear myself saying, that person probably likes and supports this blaming society we’re in. Then, I realize I’m supporting this blaming cycle by consuming myself with this kind of thinking. What a vicious cycle! I am also becoming more aware of how the media affects my perspective when I listen, see, and read stories about heroes and good Samaritans. I see how my energy feels lifted and I feel overwhelmed with gratitude and awe of how these people just jumped in to help in the best way they knew how. I feel my body’s energy feel a rush of inspiration. I walk out of the house wanting to smile at strangers, engage with people I can tell don’t feel valued, and just be and do better. Today, I commit to being mindful of where my thoughts go. I will choose what I listen to, read, and see wisely. I will commit to putting my energy into the life I want to be living. I didn’t realize how hard I was being on you when I chose to self-blame. I didn’t see how I had higher expectations of you than any other human and that’s not right. You are HUMAN. You are going to make mistakes in order to learn the lessons you need to learn. I want to project a loving energy. That means that I have to show that energy to myself too. I can’t be blaming ANYONE including me. I want to be kind to myself. I want to show myself the compassion that I’m so open to share with others. I’ve seen too many people go down that slippery slope of self-blaming and I’ve felt what it’s done to me already. I’m ready to experience better. I’m committing to recognizing when I move past taking personal responsibility to self-blame. I will focus on putting my energy in the best place to serve the life I want to be living. I feel blessed that I’ve caught myself in my self-blame cycle before matters got more extreme and my life was on the line. From here on I know the difference and I will pay attention to how my body is reacting when I’ve made a mistake.